This fall marks the third year since November was declared National Diabetes Month via a 2016 Presidential Proclamation. With approximately 1.5 million new cases of diabetes diagnosed annually, the need to raise awareness about diabetes throughout the United States is clear. However, it’s less commonly known that diabetes can affect dental health, for example, by causing diabetes tooth loss. A 2017 study by the University of Pennsylvania revealed the extent to which the oral microbiome is affected by diabetes. Mice with diabetes experienced a sizable increase in the number of harmful bacteria inhabiting their mouths, which led to inflammation and bone loss. They had periodontitis and increased levels of IL-17, a molecule that is important in immune response. High levels of IL-17 are associated with periodontal disease in human beings. The study demonstrates how diabetes can cause changes in oral bacteria which drive inflammation and bone loss. According to the authors, glycemic control and good oral hygiene significantly decrease the risk of periodontitis in people with diabetes. 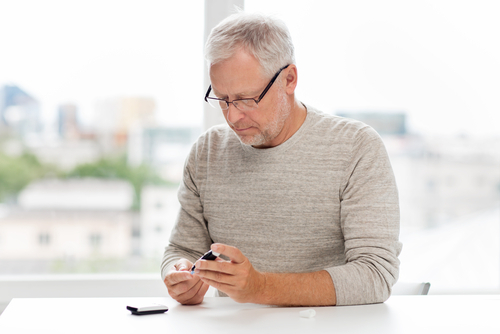 If you or a loved one is living with diabetes, then you’re probably familiar with the common practices used to manage the disease. Even so, it’s possible to overlook the oral health conditions often associated with diabetes. The important thing to remember is that improved oral health has a positive effect on the disease, and vice-versa. Diabetes affects the body’s ability to process sugar, specifically as a result of insulin deficiency. Insulin is responsible for carrying sugar to the cells in the body. When insulin is not produced in sufficient amounts, glucose becomes more concentrated in the blood. High blood sugar levels have damaging effects on major body systems, including the oral cavity. Diabetics have the additional problem of a depressed immune system, which makes it harder for the body to fight off bacteria. That means a build-up of plaque, which leads to a higher incidence of cavities and gum disease. Periodontal disease, a severe form of gum disease, is especially prevalent among people with diabetes. Periodontal disease affects almost 22% of those diagnosed with diabetes, as compared to the baseline of 8.5% of the general population. Many more diabetes patients have gingivitis symptoms (a less-advanced stage of gum disease). Gum disease is the leading cause of tooth loss, which is why tooth loss associated with diabetes is common. Emerging evidence shows the two-way relationship between periodontitis and diabetes. Diabetes increases the risk for periodontitis for the reasons stated above, while gum inflammation also negatively impacts on glycemic control and thus the trajectory of diabetes. Patients with severe periodontitis are three times more likely to suffer end-stage renal disease and are at much greater risk for heart disease. As all diabetics are aware, maintaining normal blood sugar levels is very important. Extreme fluctuations in blood sugar have negative repercussions on the oral environment. That’s why controlling glucose levels well can actually decrease your risk of developing periodontitis. Regular dental hygiene can make a big difference to your overall health, especially if you have diabetes. Follow the basic recommendations of your dentist in your daily brushing/flossing regimen. Include the gums and tongue when you brush your teeth. If you notice bleeding on a regular basis when brushing or flossing, this is an indicator of mouth inflammation. Visit your dentist as soon as possible because timely treatment will help put a stop to the inflammatory processes early. If you have dentures, take the time to clean them daily after removal. Leaving dentures in the mouth for over-extended periods can foster harmful bacteria. Staying hydrated helps to combat dry mouth, which often affects people with diabetes. A lack of saliva leads to a dry environment where antagonistic bacteria can thrive, uninhibited. Eating a hearty portion of fruits and vegetables each day will improve your oral health. Higher intake of fruits and vegetables was found to be a successful intervention to promote healing in patients after non-surgical periodontal therapy. Getting the right nutrients and antioxidants is an essential step in any health strategy to combat periodontitis (and its effects on diabetes). Avoid tobacco products. Nicotine alters the way your body processes glucose and changes the chemical interactions in the cells so that they don’t respond to insulin. The cells need insulin to remove sugars from the blood and use it for energy. Tobacco consumption thus exacerbates diabetes by contributing to the conditions that cause high blood sugar. Even if you are pursuing a healthy diet and controlling your glucose, using tobacco will undo any headway you make. Remember, second-hand smoke also affects a diabetic’s health and should be avoided as much as possible. Finally, people with diabetes should make a point to visit the dentist for cleanings and checkups every six months. Frequent appointments are important for the prevention of periodontal symptoms, which in turn help to guard against worsening diabetes symptoms. How Can A Dentist Help With Diabetes Tooth Loss? Gum disease often leads to diabetes tooth loss, which can cause many associated problems. The good news is that you don’t have to face these diabetic problems alone. A good dental team can identify the signs of undiagnosed diabetes and offer targeted preventive care. Every diabetic should have the support of a highly qualified dentist with knowledge about the relationship between diabetes and oral health. Penn Dental Medicine (PDM) can coordinate with your other physicians to ensure continuity within a full spectrum of care. Our goal is to help you live the healthiest life possible, without the additional dental complications that diabetes can bring. Penn Dental Medicine provides dental care at an affordable price. To set up your first appointment at PDM, please give us a call at 215-898-8965.